This bread machine French bread is mixed and kneaded in the machine on the dough cycle, then baked to crusty perfection. The key to the crust is the hot water on the lower oven rack, and baking it at a higher temperature for the first 15 minutes. Slice the baguette at a slight angle, then season and oven-toast for delicious homemade croutons. 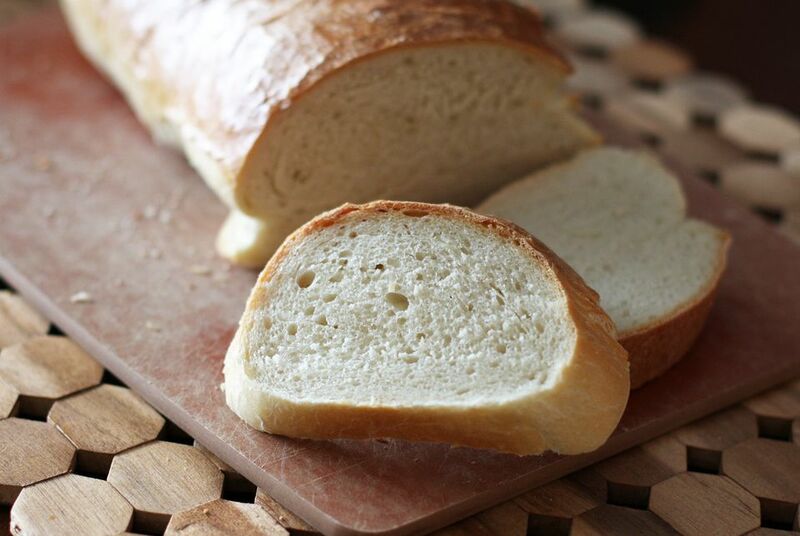 This bread machine French bread recipe makes 1 loaf of wonderful, crusty bread. Add first 8 ingredients to bread machine. Use the French Bread setting of your machine, but remove the dough before the baking cycle begins. Or, use the dough cycle, punch down to let air escape, let rise again (45 minutes to 1 hour), knead lightly, let rise again, form into loaves. Spray or lightly oil a large cookie sheet; sprinkle with cornmeal. To form loaves: Transfer dough (it will be soft) to a lightly floured board. Sprinkle with a little flour; cut dough into 2 portions. Roll each portion into a rectangle about 12 to 15 inches wide (add more flour as needed). Starting at long end, roll up; pinch seams well. Repeat with next roll. Place loaves on prepared cookie sheet; cover with clean dish towel and let rise another hour. Preheat oven to 400 F. Place a pie plate on the lower rack of the oven; add about 1 inch of boiling water to the pie plate. Bake bread for 15 minutes; lower heat to 350 F. Bake for another 25 minutes. About 5 minutes before loaves are done, brush with the egg white and water mixture.